Let’s take the clocks back to 2008, more specifically April 29, 2008. Grand Theft Auto IV, the juggernaut, the first true successor to Grand Theft Auto III, the first Rockstar title on the then new generation consoles (that people cared about, sorry Rockstar Table Tennis), an all around huge deal. Everyone was excited an with good reason. Not only was it a new Grand Theft Auto but it was receiving such enormous critical praise. A+ from 1up.com, 10/10 from Edge magazine, 10/10 from Game Informer, 10/10 from IGN, 10/10 from Gamespot… I could keep going but you get the picture. Grand Theft Auto IV wasn’t reviewed as a good game or a great game, it was billed as a perfect game. So yeah, people were understandably pumped. Then it came out and we all got our hands on it and it was… good. Don’t get me wrong, I enjoyed what I played of Grand Theft Auto IV but that’s just it: I didn’t even beat this game. The story wasn’t strong enough to pull me in and motivate me through it. Well, it might have been if not for all the bogus side quests that filled Grand Theft Auto IV. I’m talking the whole character reputation system: the fact that you had to keep doing really stupid things with cousin Roman, a character who was spectacularly annoying. 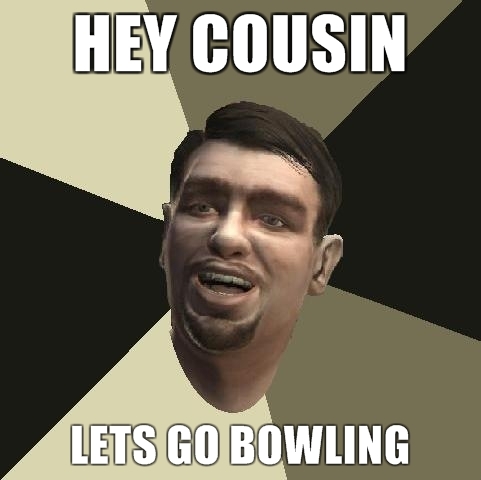 Seriously, it’s GTA IV, I didn’t spend 60 bucks to take Niko’s idiot cousin bowling. But the game is full of such instances and really, none of them are that fun. The problem caused an abrupt shift in tone. Grand Theft Auto IV had a dark, at least semi-serious tone with gameplay that was anything but. Ever tried to drive around the city without crashing into anything? It’s really hard, much harder than killing thirty gangsters in a firefight or flying a helicopter. in other words, almost as hard as bowling. Yeah GTA IV operates under different rules than the real world, certain things are just harder to do. Scenes like this were common and prevented any serious tone. Now did this make Grand Theft Auto IV a bad game? No, it was still really fun and possessed many gameplay mechanics that were cool to fool around with. 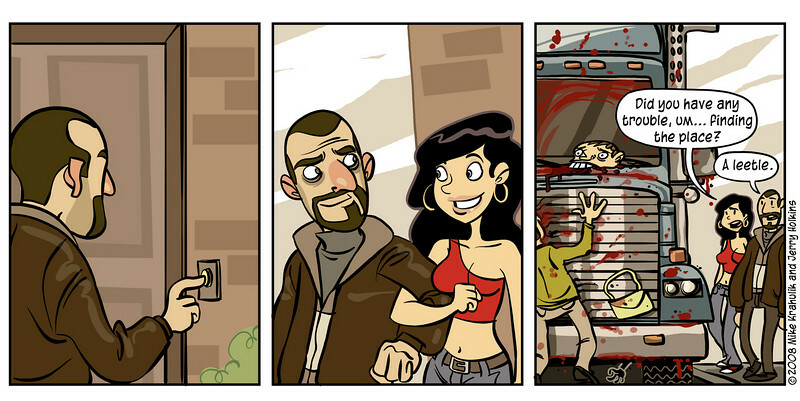 I have very fond memories of the multiplayer in GTA IV. My point is: it wasn’t perfect yet the “critics” bilked it to us as such. This is not the only time this has happened. Like it or not, there’s a lot of money that go into AAA games and sometimes part of that dough is spent paying off the reviewer. I’m not just being paranoid. Gaming sites like Giant Bomb were founded because of this occurance (Jeff Gerstmann, the founder, was fired from Gamespot for giving Kane & Lynch: Dead Men a bad review when he wasn’t supposed to). So let’s fast-forward a few years to late 2011 and the release of Saints Row the Third. 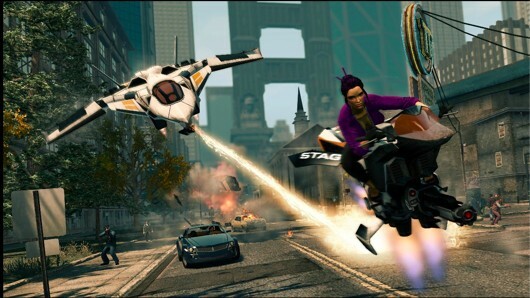 For any out there who don’t know, the Saints Row series is very similar to the Grand Theft Auto series. Both are large, open-world sandbox games that pit the protagonist in the role of someone constantly subverting the law. The difference: GTA IV tired to be serious while Saints Row the Third features Burt Reynolds as Mayor Burt Reynolds. Also while GTA IV made you do bowling and dating side missions, Saints Row the Third is happy to give you a tank and let you rampage to your heart’s content. Point is: Saints Row the Third knows exactly what it is and it all the more fun for it. Now, what kind of reviews did Saints Row the Third get? Pretty positive. The game posted an 84 overall on metacritic and gamerankings. It did not, however, have any notable 10/10 reviews. This is fine because Saints Row the Third is not a perfect game by any stretch (there’s several bugs involving your “homies” that can really screw up missions). It is, however, a far more even experience than Grand Theft Auto IV, featuring more engaging gameplay and a much more consistent tone. You can ride a hover bike and be chased by a laser-shooting jet cause why not? So where’s the love? Nah, I’m just kidding. It’s better that games like Saints Row the Third get rated as they deserve and not as the marketing dictates. Luckily we have moved away from the days of constant 10/10 reviews for AAA games. Does it still happen? Sure but not nearly as frequently. This is a good sign that we, as consumers, have grown more intelligent in our approach to game reviews. Here is a good piece of advice: don’t believe any 10/10 reviews. That implies perfection and I don’t think I’ve ever played a perfect game. 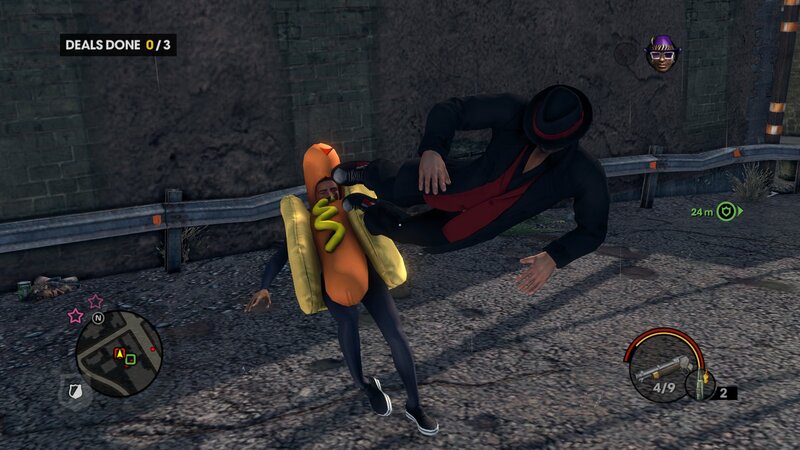 You can also jump kick a guy in a hot dog suit. Yep. So if you have any cravings for a GTA-style game to hold you over until Grand Theft Auto V‘s release, do yourself a favor and play Saints Row the Third. It is an example of a superior game with inferior dollars. While it may not have been a AAA release like Grand Theft Auto IV was, it still has something that game didn’t. Well it has a lot of things that game didn’t, ninja gangsters for one thing. And there’s not a bowling alley in sight.